It’s new 2019 year already here. On the first days of the New year, we always think about the main events of the previous years in our lives and also make some plans for the future. So often we make some resolutions for the next year – for improving relationships with spouse, giving more attention and time to parents or children, changing professional career or just having more time for our hobbies. But what to pray for in the world today? As Christians, we should not focus only on our personal lives, but also we need to seek spiritual growth as well. Our growth in the spiritual life is the basis for all other things in our lives. One of the most essential practices for spiritual growth is our constant and regular prayer. As the Word of God states in James 4:2 “You do not have because you do not ask God.” So what to pray for in the world today? We communicate with God through prayer. All other spiritual practices also begin with prayer. Prayer is the only way to let God know your intentions and to ask His help in any situation we need His help. So as you begin, 2019 year keep the following prayer points in mind so that you can start the year with a regular and effective prayer life. This will lead you on your way to a better year overall. And another important issue for this year – pray not only for personal needs but also for the needs of other people and mankind in general. What to pray for in the world today? • For peace around the world. It is a great pity that each year we must include this prayer point into prayer point list. Cruel armed conflicts take place in the different locations of the world. People don’t believe in God and pretend they are gods themselves. Let’s keep people who live in armed conflict zones in our prayers. Let peace come to their countries and homes. • For persecuted Christians. It is hard to recognize, but in the XXI century, we only declare democracy, freedom, and tolerance. Reality is totally different. Millions of Christians in different countries are persecuted and suffering for their faith. Many of our brothers and sisters in Christ each night go to sleep with fear they won’t see each other next morning. Let’s pray that God relieve this persecution and everybody is able to worship God without fear. • For young people around the world. Youth our young generation are the ones on whom depends on the future of our planet and all mankind. When God created mankind, He said them to rule the earth. If there’s ever been a time when our prayers have been needed, the time is now. We really need wise, responsible and God loving people to rule the Earth. • For Christian Churches. The Church as a community of the believers have a clear mission – to show the face of God to the world and the way to the Kingdom of God to people. Jesus said, “By this, all people will know that you are my disciples if you have love for one another.” (John 13:35). Let us pray this year for the Christian churches in all the world and in our city. Let members of the Christian churches listen to the Word of God and follow Him and don’t submit to the secular society requirements. Let’s pray that the communication and relations between Christians will be an example of love, not anger. • For schools and teachers. Schools are important institutions in all societies and communities. Education of young people is very hard work. Teachers often face difficult challenges and decisions each day, and the future of our nations depends on them, so we need to keep all people working at schools in our prayers. • For all families. People face different problems and hard situations in marriages and families lives. Let’s pray for God to help married people to treasure marital relationships and their families. Let they live in love, forgiveness, and unity. • For good health. Science and technologies are developing rapidly, but this progress doesn’t make our health better. Let’s ask God in our prayer for good health for our family members, for people who are suffering from painful diseases, and for ourselves. • For freedom from anxiety. We live in a stressful world which creates the illusion that we don’t have time for ourselves, our families, and finally even for the living. All this leads to the existential anxiety which makes us feel living meaningless lives. • For understanding that Jesus is the only way to the Kingdom of God. This is one of the most important things what to pray for in the world today. We need to realize clearly that there is no other way to salvation than through Jesus Christ. Eternal life in heaven is made possible only through Christ. We shouldn’t look for different alternative ways, because they don’t exist. Let’s pray God to strengthen our faith and receive His forgiveness to get the final gift – eternal life. In the coming year, we hope you will keep the most significant relationship you have by praying for God’s will to be done in the world, community, your family, and your life. 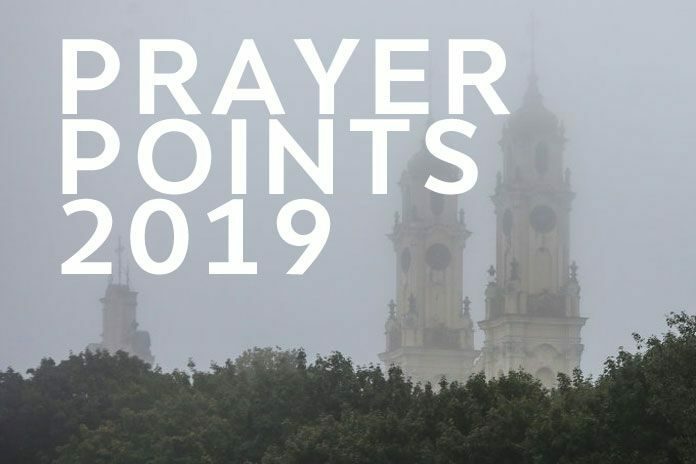 it you have a question what to pray for in the world today, then follow prayer points for the year 2019. This will lead you to a blessed and prosperous life in 2019 year.